"Ocean's Gem" at 13 Man O' War is a gorgeous oceanfront delight in the heart of Palmetto Dunes Resort with 4 bedrooms and 4 ½ baths or 5 bedrooms and 5 ½ baths. Choose the 4-bedroom configuration with bedding for up to 10 guests, or upgrade to the optional 5th bedroom with extra full bath to sleep up to 14 guests. This Mediterranean beauty shines with exquisite attention to detail from the welcoming front atrium furnished with table, chairs and 2 chaise lounges and surrounded by vibrant grapevine covered columns and trellis to the main living room's back wall of floor-to-ceiling windows that pull you to breathtaking ocean and pool views. The kitchen has ocean views and features granite counters, Thermidor 5-burner gas stove, double ovens and dual temperature wine cooler. The kitchen is conveniently located near the formal Dining Room with 10 foot table, seating for 14 and built-in wine glass pantry to increase kitchen storage. The kitchen also opens to the Family Room with high end sofas and chairs, and the breakfast nook with seating for 6 has a lit pedestal base and overlooks the outdoor patio, pool and ocean. 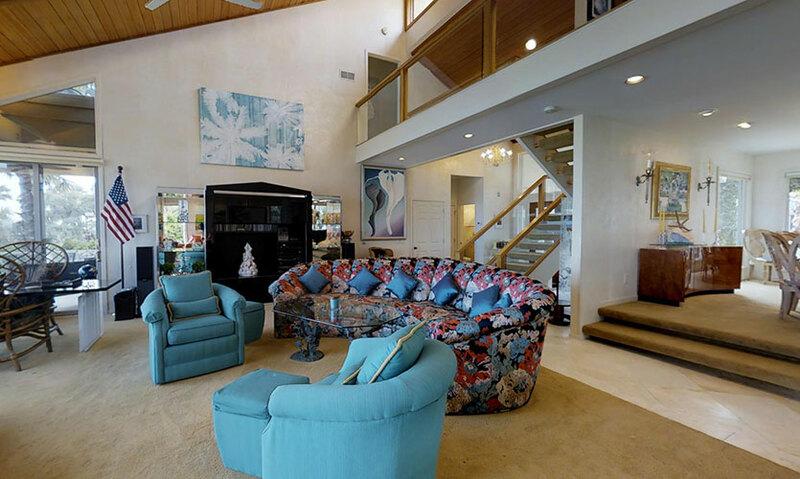 The fully furnished formal living room is oriented to maximize ocean views from the impressive wall of windows and a desk area on the ocean is included for those who need to mix business with pleasure. A 60” TV with blue-ray player hangs from the ceiling on a swivel and track and can be viewed from the living room, family room, breakfast nook or kitchen. The 5 bedrooms each have en suite bathrooms, large closets, flat screen TVs and DVD players. The master suite on the main level has a Sleep Number bed with dual controls, glass-fronted private oceanfront patio and large bathroom with separate tub and shower. The 2nd floor oceanfront bedrooms include a King suite with full bath and tub/shower combination and a Queen suite with electric fireplace with multicolored ambient lights and full bath with large shower. Each of these 2nd floor suites has a stunning ocean view and glass-fronted private patio with chaise lounges to create a unique island getaway. The 4th guest bedroom features 2 Queen beds, sitting area with a peek of the ocean and full bathroom, and the 5th bedroom has a Queen bed, Queen Murphy Bed, sitting area with ocean peek and private bath. Amenities at Ocean's Gem are simply awesome. No detail has been left unnoticed inside the home with upstairs and downstairs laundry facilities, elevator service to all floors for special needs and luggage movement, double garage for guest use, state of the art alarm system with 1-touch emergency calls, pantry and cupboard for extra kitchen storage, special lighting throughout the home to eliminate floor lamps that block the ocean view, spare refrigerator and Martha Stewart gift wrapping station with stock. The home features a large infinity pool with upsized pool heater, hot tub and outdoor kitchen, built-in Delta Heat grill, fully equipped bar with granite counters and bar seating, comfortable patio furniture, table, chairs and LED lighting to create ambiance. A private pathway takes you to a secluded beach perfect for watching sunrises, sunbathing or catching views of dolphins at play. With two levels of covered and uncovered patio areas, the setting is perfect for entertaining, eating, reading or relaxing all while enjoying the breathtaking ocean views. The pool and spa will provide hours of fun for the entire family and the pool may be heated upon request for an additional fee. Wireless internet is available at no cost to guests. Palmetto Dunes is a world-class vacation resort with pristine beaches, miles of biking trails, world-class tennis center, golf courses, and Shelter Cove Marina with shopping, restaurants, fishing charters and boat rentals. We have been coming to Hilton Head for fall break for over 18 years and have stayed at multiple houses. This was our first time on Palmetto Dunes. We loved the area, the beach was great, and the house was wonderful. Spacious and well equipped. Everyone who came agreed this was now one of their favorite homes. My Aunt and cousin from England always accompany us on these trips and thoroughly enjoyed themselves. Nice house for elderly people. The patio by the downstairs master bedroom was the favorite hangout. The view of the beach was fabulous and the sunrises spectacular. We did have a little excitement with the 11 PM tornado alert ( nice basement for such events). We would definitely reserve this house again. We have never had issues with Destination Vacation and we would highly recommend them. Fantastic home. Leave your beach tents at home. You are on the beach while sitting by the pool. Everything you could wish for is provided and then some. Overly equipped kitchen, quality kitchenware and appliances. Unbelievable views from most every room AND from the Large infinity pool. Home is very well sound insulated. Quiet section of Palmetto Dunes. Would have liked a couple of pool side patio umbrellas for shade during heat of the day. Thanks Kathleen for your attention to detail. 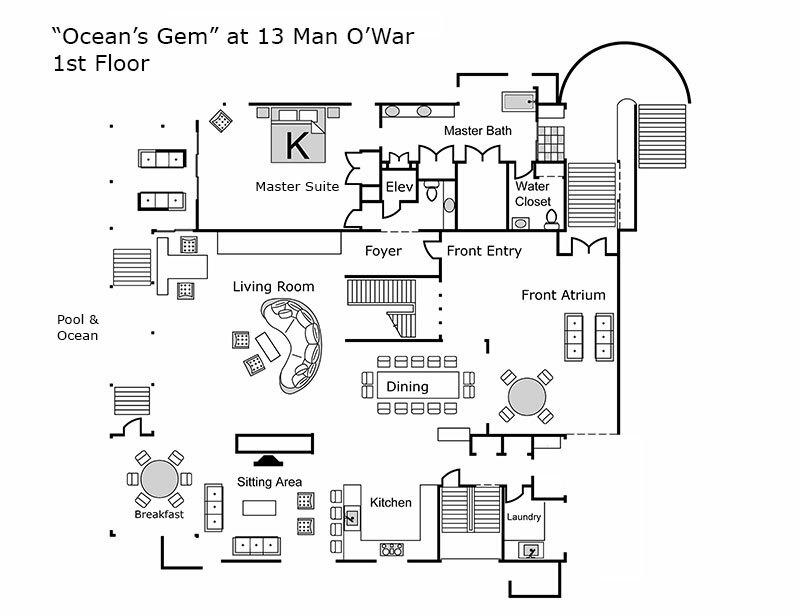 13 Man O’ War is a stunningly beautiful property. It is a large luxurious home with many amenities. It is a wonderfully maintained property but things can and do go wrong. I needed to make a couple of calls to the DV office and I could not have been more pleased with their quick response to everything! It didn’t matter if it was a question about how something worked or to report a malfunction. Each phone call or issue was handled immediately. I wish DV could manage my home in Chicago. Really a pleasurable stay from start to finish. Gorgeous home. We had a few issues during the week with the a/c - staff at Destination Vacation were courteous, prompt and understanding. Issues dealt with and resolved! Amazing group of folks! We love Ocean's Gem it was our third time staying there. Everything is top notch and the view can't be beat. Destination Vacation makes it all simple and easy so you can just enjoy Hilton Head. Excellent house, expert service from Destination Vacation. We love staying in Palmetto Dunes. The home was absolutely beautiful and well equipped. Met my family's needs perfectly. Would have liked to have had a table on the patio by the pool. This is the first time we have been on the ocean - all other places were second row. Loved it! Was impressed with dealing with Destination. Also, first time ever that you could actually talk to the owner. We have a whole family vacation on Hilton Head every other year and unless the size of our family grows too much, we will consider coming back to 13 Man Of War. It is always a pleasure to have delightful guests like these folks were. They cared for my home as if it were their own. I had not known that the new table had not been set up (the previous guest left the umbrella up and tipped and broke the last one) or I would have intervened! The new table is a lovely Pier 1 wicker dining table with a bench on one side, 2 armed end chairs and 2 side chairs. Sorry Norma! I know that the bar stools and eating area around the grill are a bit high for the wee ones. Please come again and if your family gets bigger I have another lovely, bigger oceanfront that sleeps 23 called Sandpiper's Nook (see Destination’s 6 bedroom section). My family prefers Sandpiper’s Nook but I like Ocean's Gem best! This property is unbelievable! The ocean views make for the most beautiful sunrises. 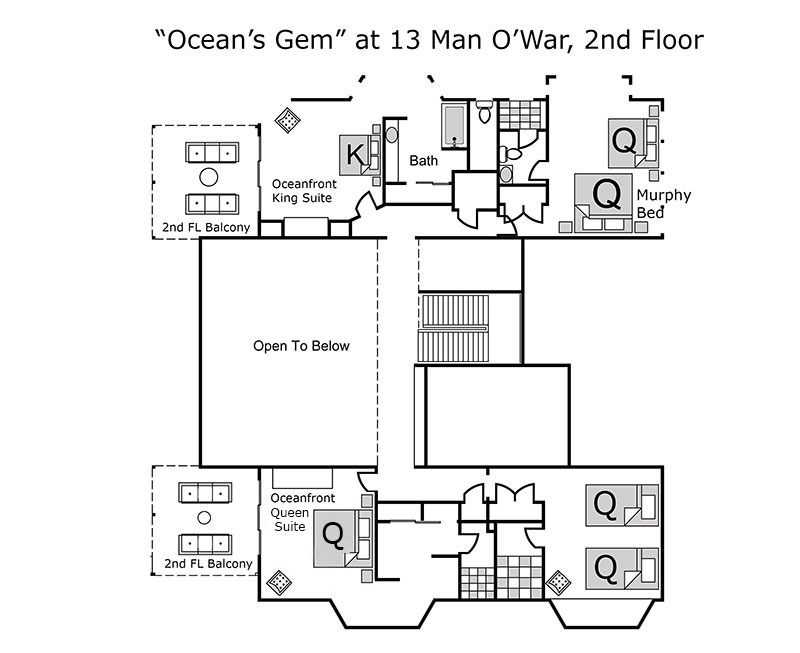 The Ocean's Gem is properly named as it provides luxurious amenities in a environment that could not be more relaxing. No detail was overlooked in the planning of this beautiful home. I will not soon forget my stay at the Ocean's Gem and would confidently recommend it to anyone looking for a peaceful getaway. "Spectacular - A Perfect Christmas at the Beach"
This home was nothing short of incredible. The whole experience at the house provided us with quite a memorable Christmas. The amenities are truly first class and are exactly what one desires in a 5 star beach house. The pool and spa were hassle free and stunning, the upstairs rooms provided breathtaking views and sunlight in the morning, and the living quarters of the home are great for a large group to sit back relax and spend time together. I would highly recommend this property to anyone looking for a vacation on Hilton Head Island. This is such a beautiful home. Grand, elegant, stunning ocean front location yet warm, welcoming and homey. From the moment we walked in we all felt at home. There are so many unique features. Our favorite was the large suspended TV which could be turned for viewing in any direction. The lap of luxury is where you will find yourself here. We will definitely be back. This secluded beauty had everything promised..and more. While eating in the dining room we spotted a deer near the backyard. While biking one evening we saw a male and female anhinga roosting by a nearby lagoon while an alligator floated by. Green Heron, osprey, kingfisher were also spotted. Very little traffic and great biking trails. The home was comfortably and thoughtfully furnished, the kitchen well equipped, the fixtures and appliances top notch and conveniently located. This is a beautiful property. It has amazing views from the living room & 3 of the 5 bedrooms. It is very clean & well maintained. The home is beautifully furnished. The owner is great to work with, & I would definitely stay in this property again & would recommend it to friends & family.